We’ll be heading to market again soon so that means we have our clothing and shoes on SALE! 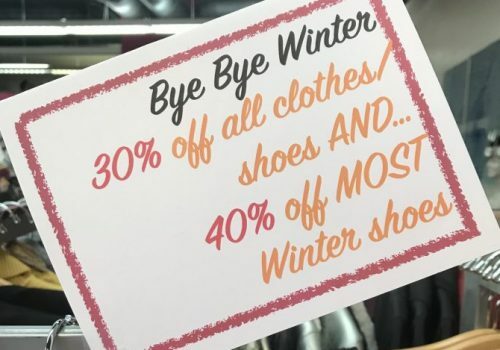 30% off all clothes, shoes and 40% off MOST Winter shoes! Come visit us at 1302 Commercial Street, (in the Parkade Building) in downtown Bellingham. We’re open 11-6 Monday through Saturday, and 11-4 on Sundays. We are open late on Thursdays until 8 pm and until 9 pm during special Downtown Bellingham events like Art Walk, which is held the first Friday of every month! Contact us at 360-733-1323 for more info and/or to sign up for any class.